Want watch a movie? Buy an extra ticket, invite someone! Want to eat italian for the first time? Invite someone along for the experience. Remember that festival you won’t attend because your friends ditched you? 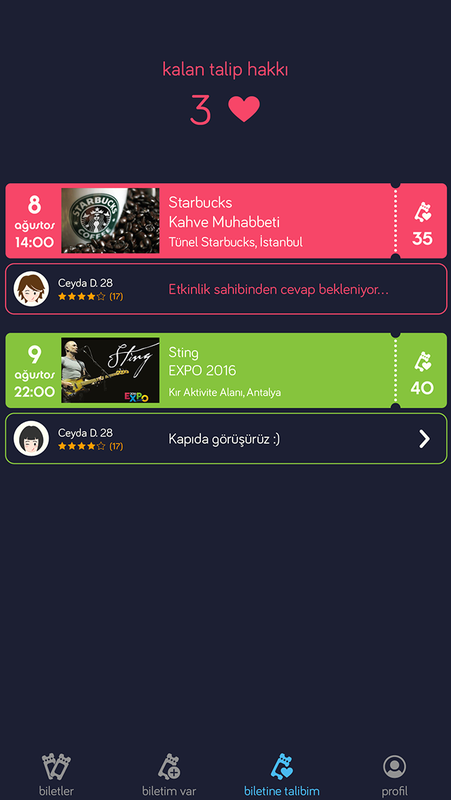 Now you can put those tickets to good use and invite people who have the same taste in music. Join the flow of events. Apply to an activity on the list for a chance to join. Or, create your own activity, choose from the “attendees” and attend it with them. “Stalk” the people who applied to your activity. You can check their registered Facebook, Twitter and Instagram accounts before you attend together. You own the ticket, you choose who tag along. If you regret your choice, you can end the conversation anytime and pick another “attendee”. While applying for an activity, it is always good to do so with an effective and honest message. Ticket owners will want to check your social media accounts, and you should help them to know you better. The developement team is constantly watching over people and will act swiftly and decisively in any reported insult or harrasement cases.